This blog is meant to be a collection of notes and stray thoughts which I find interesting or entertaining. I have never blogged or been blogged but Harriet referenced your blog in an email and I googled you and found it (Now i need to figure out whether being googled or blogged is better, but I will leave that for another day). Sounds like you guys have another one of your fabulous trips planned while the rest of us manage a trip to the grocery store and to Target if we are lucky. Keep in touch. Great to hear from you, Melissa! You’ll definitely be getting trip reports. It left me utterly speechless! Once again I’m completly jealous of your other-worldy travels and experiences. And yet cannot wait to hear more! P.S. I was wondering why I hadn’t been receiving travel updates via e-mail. Why have I not heard of this website before?? Thanks for stopping by. I’m sorry I didn’t get a chance to respond before now, but it’s a little easier now that we’re back home. I didn’t push the blog very much before the trip because I’m still pretty new with it all. We’re shaking the technical problems out (harder when on the road), but I think it was a big success. We’ll continue using it in the future. Plus after the trip, I’ll keep making personal notes and observations. Stick around for whatever interests you. BTW – Libby and I still have your France travel books from our Euro trip this summer, and would like to return them ASAP once you’re back. Alan, where are you? You haven’t updated either blog in quite a while. I really miss reading them. Will you be back soon? Hi Lauren, and thanks for the note. I am in town, and just distracted enough by life to have let the number of posts I intend to make exceed my casual response threshold (how’s that for an engineer’s obfuscation). It’s sort of like when the number thank you notes that you owe has built up to the point that you need to dedicate a large amount of time to just get started. Really, I just need to get started. I’ll use your note as the ‘kick in the posterior’ I’ve been needing. I never thought I’d see the day. I even took a deep breath and I still can’t believe it. I just had lunch with Phil, Morgan, Mooy, and Gail. Great time but too short to really catch up. I’m living in Ojai now with Gail. I like it here. Quite the guest list for lunch! I’m sorry to have missed that. I’m glad to hear that Ojai suits you so well. We’ll have to catch up sometime! Gail moves to Aegis this coming weekend. Maybe we can get together before then for lunch and you can meet her and we can catch up. I’ll call you. Great pics from your travels. It sounds like you come here more often than facebook so I thought I’d post the same thing here. There are women in optics. Looked over all your SPIE papers. Actually I am a physicist doing sw but having to deal with Mechanical Engineers. I have just started working with SBIR here in Austin. Talked to Steve White he promises you will get me required software as soon as you are back from Florida. Cute you named the SW after yourself. 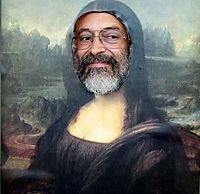 Alan-I like your current Fo-Man-Chou disquise better than your Mona Lisa. What great tales these are. Thanks for compiling them. Makes me want to fly to a pool in Little Cayman while Andy scuba dives!!! Harriet, we miss you very much. When are you two returning? Raining buckets in Calif.
Alan: your Mom turned me on to your blog. Fantastic! Will look forward to being kept up to date. When will you visit ancestral villages of Tameiron in Spain and El Quelite in Mexico? I would to get in touch. I need a headless horseman costume for a commercial. Would you be willing to rent yours out? Hi Alan, it’s a pity that you don’t deal with the bookmark s page any more. I’ll be pleased if you spread the word. Could you send me an email address where I could contact you or a physical address I could send a letter to?